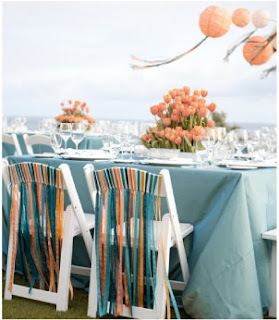 I absolutely fell in love with the rustic chic look of this tablescape and was even more excited when I saw that Carissa from JL Designs actually provided the tips on how to make it happen! 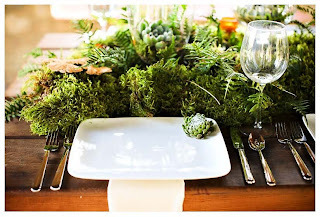 This would be an awesome tablescape this fall for an upcoming dinner party. 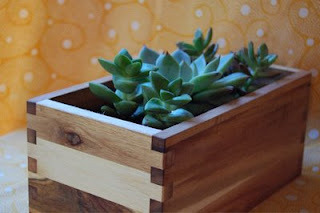 I could even see working in some aspen or birch branches for even more texture and height. 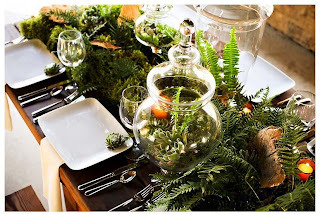 Carissa suggests using the following items when recreating this gorgeous table! Optional: wood chips from home depot, fresh crimini mushrooms from a grocery store, pieces of knotted grapewood branches, etc. In my house, I have a whole drawer dedicated to nothing but ribbons. I think that they are just such an easy way to brighten up any gift and I find such inspiration in the colors and textures of the ribbons available today. 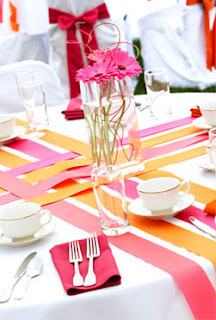 I am so glad to see that more and more people are using ribbons in their décor schemes when hosting parties. 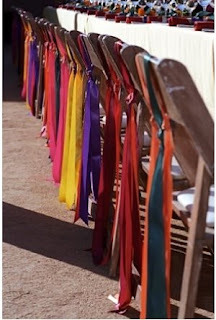 I especially love multi colored ribbons on the back of chairs at an outdoor party. It not only gives you a splash of color but also provides movement when the wind blows. 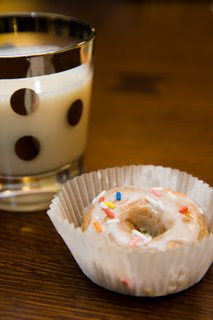 Donuts are the new cupcakes and I am loving it! 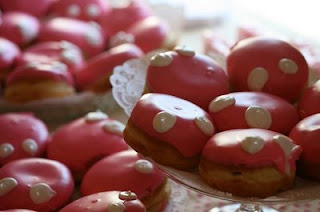 Recently I have been seeing donuts popping up everywhere from wedding receptions to back yard parties. 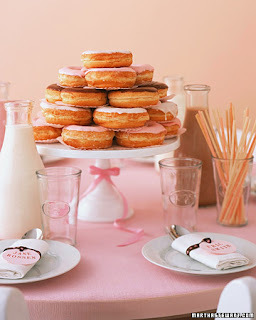 Below are photos of a few fun ways you could incorporate donuts into your next party!! Instead of a cupcake tower make a donut tower. Frost the donuts to tie them into your event. Serve them in individual cupcake wrappers for less mess. 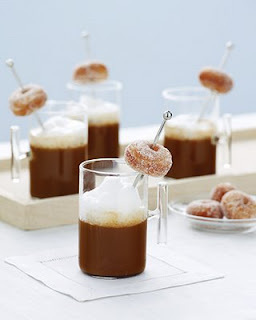 Perk up your coffee buffet by offering mini donuts. I also really love the idea of featuring a mini donut decorating bar with toppings such as caramel, chocolate and sprinkles! Mini donuts rock! 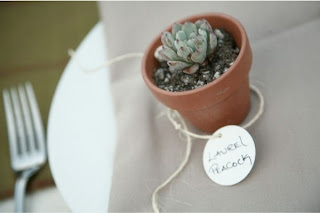 When I saw these adorable little potted succulent place card holders on Yes, Please and Style Me Pretty I screeched and knew I had to share them. They are so cute they have me smiling! 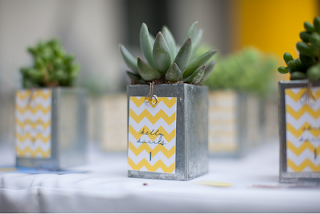 The best part is that Kelly over at Yes, Please has shared all her tips and tricks for making these easy succulent place card holders! 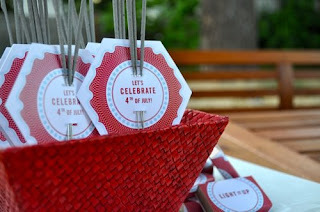 I am getting ready to take off for a weekend by the lake with my handsome hubby and some amazing friends but before I take off I thought I would leave you with this amazing red, white, and blue DIY to dress up your July 4th festivities from Twig &Thistle! 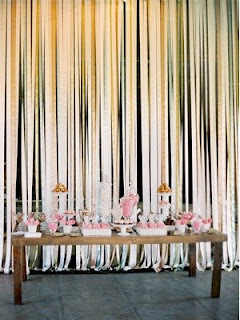 I just love the way they displayed the sparklers and matches!! So clever! 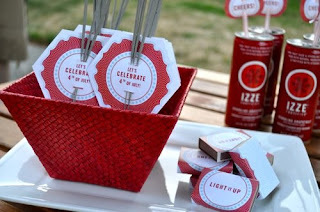 This downloadable PDF includes sparkler cards, matchbook wrappers and straw tags. 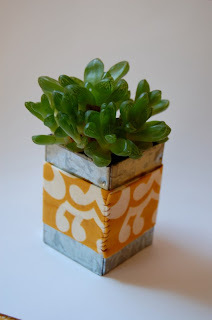 Simply print, cut, tape and voila – instant party! 1. 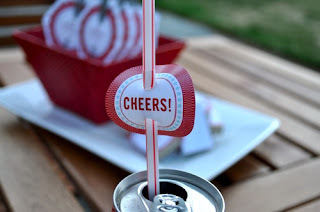 Download the Matchbook and Straw Tags Template and print onto white text paper. Download the Sparkler Card Template and print onto white card stock. Print using the highest quality settings on your color printer to ensure that the patterns and text are clear. 2. 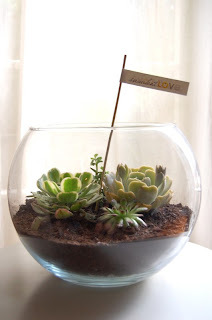 Trim out all the shapes using scissors or a sharp blade and making sure to trim off all the black edges. Use a standard hole punch and punch where indicated to allow the straws to be thread through. Carefully trim out the small rectangles in the Sparkler Holders to weave the sparklers through. 3. 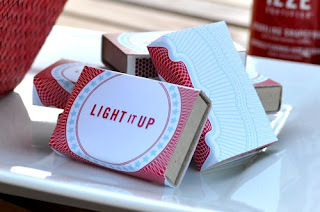 Secure the wrap around the matchbooks with double sided tape, making sure not to cover up the striker strip. 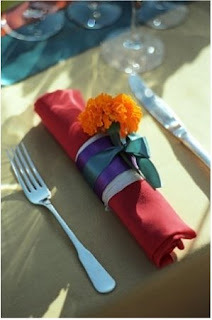 Crease the edges with your fingers or using a bone folder so that they are crisp. Thread the straw through the holes and position towards the top of the straw. Thread the sparklers through the slots. 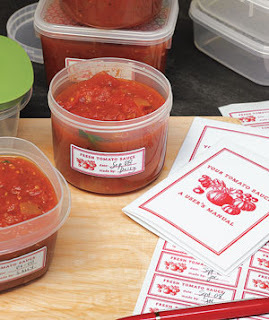 This tomato sauce party from Real Simple is an AWESOME excuse to get all the girls together! You supply the wine and have your guest bring extra tomatoes from their garden and everyone gets pasta sauce to go!! 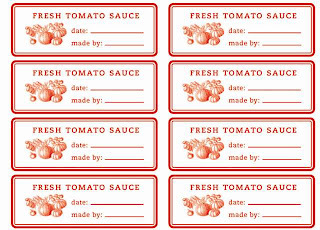 Be sure to send everyone home with a healthy portion of the sauce you make during the party and label the containers with the stickers shown below, noting the date and type of sauce. 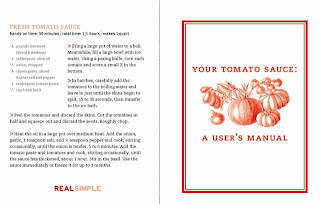 Then you can compile all the recipes you swap into a fun recipe booklet. Friday entertaining always seems a little rushed with work and commuting but you can never go wrong with a simply wine and cheese party. Cheese plates are an EASY way to look like you did a ton of work when in all reality you were sitting back sipping wine way before your guests even arrived! 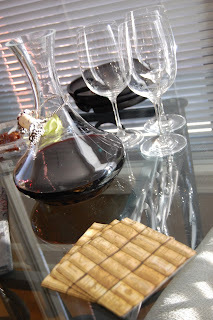 🙂 Below are some photos of my most recent wine and cheese party! 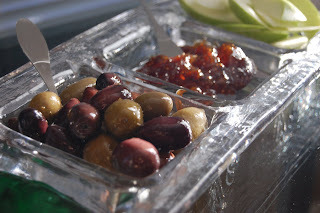 To complement the different flavors of the chesses I also put out fresh grapes, an assortment of olives and even sliced up some green apple for that tart and refreshing taste in between bites of cheese. In addition, I put out a sweet fig spread (which is awesome paired with a brie) and a pepper jam. 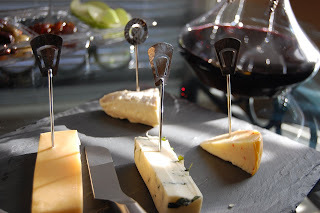 And because everyone knows that entertaining is as much about the details as it is the food you serve below are some fun links to AWSOME wine and cheese accessories. 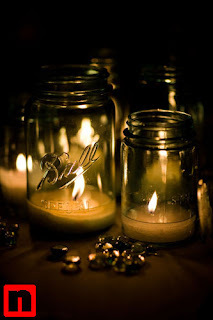 I just love this easy and creative use of mason jars to spruce up any backyard summer party! 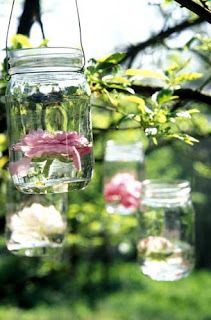 As an alternative to flowers I could definitely see floating tea lights in each jar to give a party that nice warm glow and hanging them on the inside of a patio umbrella. 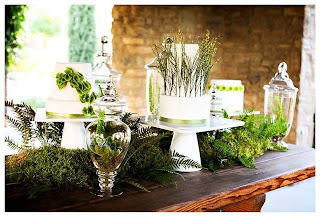 You could also use citronella tea lights and arrange different size jars in the middle of your table for an urban chic take on traditional bug repellant candles. 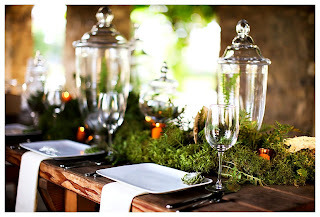 It always seems like the holidays are so hectic and even though setting a table is one of my most favorite things it always seems end up last on list of things to do! 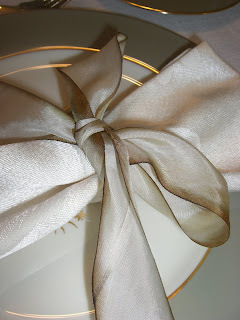 This Easter however I was thrilled to finally put to use some tea dyed ribbon that I had picked up and was waiting for the perfect occasion to use. 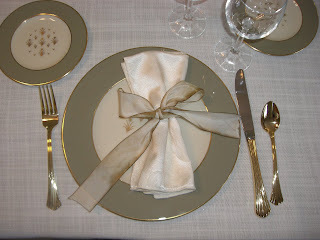 The ribbon is silk with just a slight tea color on the edges and really helped give my table that little extra “umph” at the last minute. This ribbon would also be fabulous for wedding programs or other festive event details like goodie bags. The dying process gives this ribbon a very vintage feel but still makes it modern enough to use every day. I picked up this ribbon and others at JKM Ribbons and Trims.